Lyin Ted Cruz took it one step further and "jokingly" mentions on a talk show that he’d be tempted to seriously kill Trump if he had the chance. Appearing on “Jimmy Kimmel Live,” the Texas senator was asked to reveal whom he disliked the most, Obama or Trump. “I dislike Obama’s policies more. Donald is a unique individual,” Cruz replied. “If I were in my car and getting ready to reverse and saw Donald in the backup camera, I’m not confident which pedal I’d push.” Cruz added. Do Bill and Hillary Clinton sense a breakdown in whatever deal they may have struck with President Obama to protect her presidential ambitions? Is whatever negotiation they may have been conducting over her email server problem and any inside information she may have on him now imploding? Or have the Clintons “won” the negotiation with Mr. Obama, freeing them to hit him publicly to get her elected? Something has happened, which has led Mr. Clinton to openly slam Mr. Obama: ” If you believe we’ve finally come to the point where we can put the awful legacy of the last eight years behind us ” he said recently. A few days later, Chelsea Clinton launched a broadside on Obamacare’s costs. A classic Clintonian one-two punch, coming just days before a report that the FBI is seeking interviews with Mrs. Clinton’s top aides, and likelyMrs. Clinton herself. Most investigations interview the target last. The #NeverTrump Cruzers have now joined with Team Obama to bash Donald Trump over a hoax assault. The real question is: Are they working together to bring down Trump? Yesterday group of 16 self-righteous Ted Cruz supporters released a statement demanding Donald Trump fire Campaign Manager Corey Lewandowski for allegedly assaulting reporter Michelle Fields. Fields claims she was assaulted when Lewandowski walked past her at the end of a Trump event in Jupiter, Florida. White House Press Secretary joined the Cruz-supporting vigilantes in calling for Lewandowski to step down. White House press secretary Josh Earnest on Wednesday condemned Republican presidential front-runner Donald Trump for standing by his campaign manager after he was charged with battery. Corey Lewandowski is accused of grabbing the arm of a reporter after a Trump press conference in Florida earlier this month. “I am confident that neither President Obama nor President Bush would tolerate someone on their staff being accused of physically assaulting a reporter, lying about it and then blaming the victim,” Earnest told reporters. Harvard researcher Matthew Bunn claims the Islamic State may engage in three different kinds of nuclear or radiological terrorism in the near future, according to the Express. Bunn warns IS may attack a nuclear facility and blow it up, explode a “dirty bomb,” or somehow develop a nuclear bomb and detonate it. “Making a crude nuclear bomb would not be easy, but is potentially within the capabilities of a technically sophisticated terrorist group, as numerous government studies have confirmed,” the report states. The release of Bunn’s Managing the Atom report coincides with the Nuclear Security Summit 2016 to be held today in Washington. “We cannot afford to wait for an act of nuclear terrorism before working together to collectively improve our nuclear security culture, share our best practices, and raise our standards for nuclear security,” explains the NSS website. Government studies and Bunn’s research do not take into account a number of problems standing in the way of an Islamic State bomb, most notably the unavailability of the fissile material required. The common explanation is the material will be taken from Russia’s inventory of decommissioned warheads. But even if terrorists managed to get their hands on fissile material or produced their own with centrifuges—the relatively modern state of Iran has reportedly experienced major issues doing this—building a functioning bomb is “not something you can gin up with spare parts and power tools in your garage.” It requires people with specialized skills and a safe haven for equipment. Instead of building a full-fledged nuke authorities anticipate terrorists will use a dirty bomb made of radiological materials pilfered from hospitals, research facilities, industrial activities, and construction sites, or they will attack a power plant and trigger a nuclear meltdown. The latter scenario was floated after the March 22 bomb attacks at a Brussels airport and on a metro transport, which killed 35 people and injured more than 300. It was also reported the Paris attackers planned to attack a nuclear plant after a video-recording of a high-ranking Belgian nuclear official was discovered in the apartment of one of the suspected terrorists. Following the discovery authorities warned the plan may have been to kidnap a scientist, force him to help the terrorists break into a nuclear facility and steal radioactive material to build a dirty bomb. “People have a view of there being all this nuclear material just floating around at nuclear power plants and people being able to steal them,” James Acton, a director of the Nuclear Policy Program at the Carnegie Endowment for International Peace, told US News & World Report. Nuclear fuel is not very radioactive before it is used and would need to be enriched. The other option would be to steal nuclear waste, which is described as “self-protecting” because it is so highly radioactive it would kill anybody who tried to steal it. “Fuel bundles are enormous. The idea that terrorists are going to get their hands on spent nuclear fuel is very, very unlikely,” Acton said. It would be more logical to attack a nuclear facility and trigger a nuclear meltdown. However, this would take more than one bomb and knowledge of how the plant works, making success highly unlikely for untrained terrorists. Power plants are built with redundancies and “concentric circles of probability” to prevent nuclear meltdowns, according to William Tobey, a deputy administrator at the National Nuclear Security Administration from 2006 to 2009. Terrorists are far more successful when they launch conventional attacks with small bombs and automatic weapons. A radiological attack would certainly have a more pronounced psychological effect than a conventional terrorist attack, but the technical and logistical aspects make it unlikely. The Nuclear Security Summit is an attempt to further sensationalize terrorism and keep attention tightly focused on the war on terror and enhance the “immense military establishment and a large arms industry” President Eisenhower warned about in January, 1961. When extreme monetary experimentation fails. Financial experts Robert Kiyosaki and Harry Dent are both warning that the next major economic crash is in our very near future. Dent is projecting that the Dow will fall to “5,500 to 6,000 by late 2017″, and Kiyosaki actually originally projected that a great crash was coming in 2016 all the way back in 2002. Of course we don’t exactly have to wait for things to get bad. The truth is that things are not really very good at the moment by any stretch of the imagination. Approximately one-third of all Americans don’t make enough money to even cover the basic necessities, 23 percent of adults in their prime working years are not employed, and corporate debt defaults have exploded to the highest level that we have seen since the last financial crisis. But if Kiyosaki and Dent are correct, economic conditions in this country will soon get much, much worse than this. Broader U.S. stock markets are recovering from the worst 10-day start to a year on record. ButRobert Kiyosaki — who made that 2016 forecast in the 2002 book “Rich Dad’s Prophecy” — says the meltdown is under way, and there’s little investors can do but buy gold or silver and hope the Federal Reserve slows the slide. Stocks are clearly in a bubble. The stock market is ignoring the strong dollar, which in turn hurts exports and devalues overseas earnings. It is also ignoring declining corporate earnings,imminent defaults in the energy sector, and declining global growth in general. Earlier today, I published a post titled Americans Have Been Turned Into Peasants – It’s Time to Fight Back. In the hours since, I came across an article in the Washington Post which offers some additional details and graphics on the subject. By at least one measure, inequality among working men has grown for decades. But, in 2015, it accelerated: The wage gap among men saw its largest single-year increase on record. 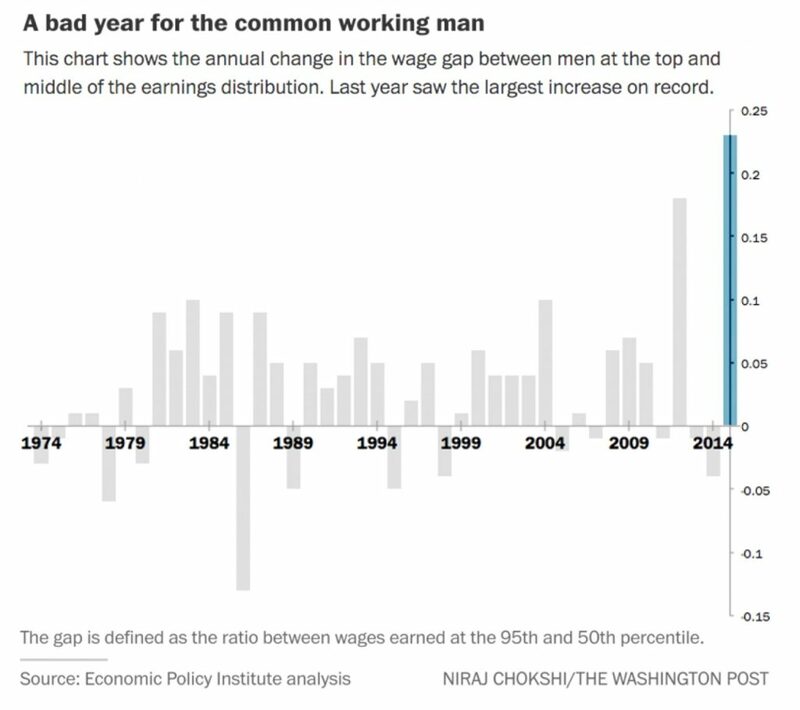 Top earners — men who made more than 95 percent of their peers — saw wages last year rise by 9.9 percent, according to an analysis of federal data. Men in the middle — with earnings higher than half their peers — saw a much-smaller 2.6 percent increase. 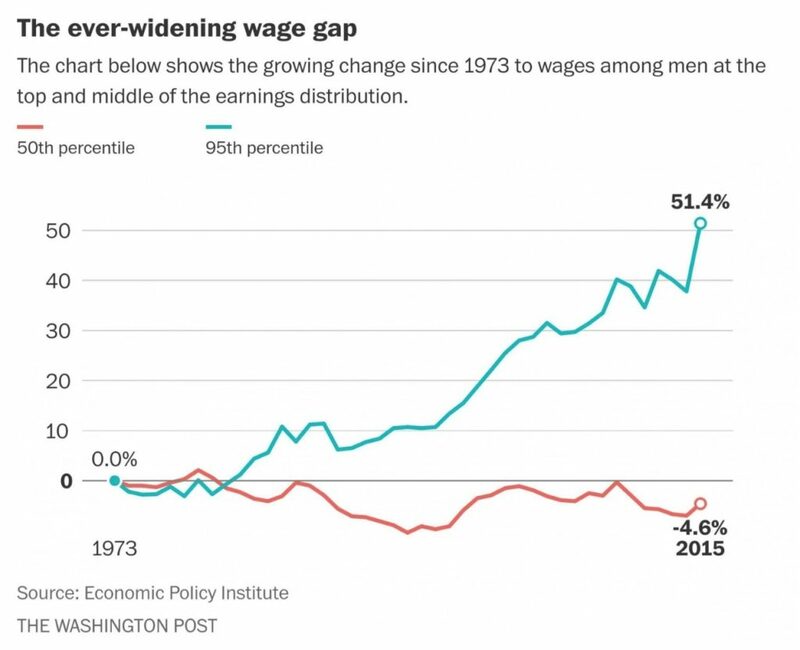 Since 1973, wages among men in the 50th percentile have fallen a total 4.6 percent. Wages for men in the 95th percentile, meanwhile, are up 51.4 percent. This isn’t the outcome of a fairly regulated free market economy. It’s what you get in a rigged economy. The American public is being used like a cheap suit by the status quo. When will enough be enough? LiveLeak exposes, in the following video, just how poor the standards can be of so-called “new” properties. LiveLeak footage shows two men in a supposedly “new apartment building” in China where the concrete walls crumble like sand. And the country is full of “ghost cities” and new apartment blocks waiting to be filled. Which is no surprise considering that China used about 6.4 gigatons of cement during their construction boom between 2011 and 2013, which is more than what the US used during the entire 20th century.However, those housing properties in China are frequently not built to stand the test of time: In 2010, officials revealed that many homes had a lifespan of just 20 years. Bank of America is reportedly asking its senior staff not to use the word “Brexit” when talking to clients, in an attempt to avoid getting involved in the fierce debate surrounding the UK’s European Union membership referendum in June. According to the Financial Times,the bank has asked staff not to say “Brexit” and “not to provide opinions, not to influence voters, not to assume a particular result and not to engage in campaigning” before the UK goes to the polls on June 23rd. The move isn’t an “attempt to muzzle or control staff” according to one insider quoted by the FT, but is instead so that the bank stays out of the limelight, and doesn’t contravene UK electoral law. Another source said that the bank is avoiding the word Brexit as it fears that it may imply a bias against Britain leaving the EU. Along with the ban on Brexit, the FT reports that the bank has also scrapped plans to give money to anti-Brexit campaigners. BOA had planned to give around £100,000 to the remain campaign, but will no longer do so. If a new financial crisis had already begun, we would expect to see corporate debt defaults skyrocket, and that is precisely what is happening. As you will see below, corporate defaults are currently at the highest level that we have seen since 2009. A wave of bankruptcies is sweeping the energy industry, but it isn’t just the energy industry that is in trouble. In fact, the average credit rating for U.S. corporations is now lower than it was at any point during the last recession. This is yet another sign that we are in the early chapters of a major league economic crisis. Yesterday I talked about how 23.2 percent of all Americans in their prime working yearsdo not have a job right now, but today I am going to focus on the employers. Big corporate giants all over America are in deep, deep financial trouble, and this is going to result in a tremendous wave of layoffs in the coming months. Seemingly the entire globe is now trapped in a regime of unprecedented monetary and fiscal stimulus required to levitate a world with unmatched debt and economic imbalances. History has seen nothing comparable. And I would strongly argue that the consequences of Bubbles become much more problematic over time.The longer excesses persist the deeper the structural impairment. Thousands of Cubans rushing the U.S. border in record numbers are being greeted with a Welcome Wagon operation that provides them with taxpayer-funded benefits including cash, a Social Security card, food stamps, and Medicaid, according to a review of the latest immigration crisis on the border. During a field trip to the Laredo, Texas crossing point, two experts from the Center for Immigration Studies documented how Cubans are provided with the services free of charge in a storefront operation set up by a Cuban immigrant, who even provides housing and schedules transportation to Miami. “The door is wide open. Come and get your free stuff,” is how Jessica M. Vaughan, director of policy studies for the Center for Immigration Studies, sized it up. She traveled to the border with Kausha Luna, who has been charting the wave of Cubans over the border. Numbers have risen sharply because they fear that as relations normalize between Havana and Washington, the U.S. policy will shift from President Obama’s open door policy of granting asylum to those from the Communist island to a more typical and drawn-out legal immigration process. Harvard researcher Matthew Bunn revealed that extremist groups such as ISIS are “evolving” and could be armed with nuclear weapons in the near future. The report on Managing the Atom by the US university researcher details the threat of three types of nuclear or radiological terrorism. This includes detonation of a nuclear bomb, sabotage of a nuclear facility and use of a dirty bomb to spread radioactive material. But the report looks in greater detail at the possibility of a nuclear bomb being detonated as it would be “most catastrophic”. The report comes as the Nuclear Security Summit sets to take place today in Washington. Former fashion mogul Pierre Bergé has lashed out at designers who create Islamic clothing and headscarves, accusing them of taking part in the “enslavement of women”. The French businessman was for many years the life and business partner of designer Yves Saint Laurent, who died in 2008. Together they founded YSL. Bergé took aim at the big fashion chains that have followed the Italian designers Dolce & Gabbana in catering specifically to the Muslim market. “I am scandalised,” the 85-year-old told French radio station Europe 1 on Wednesday. We were warned about the current situation way back in 2005, when FrontPage Magazine wrote about “The project,” an Islamic plot to take over the world.